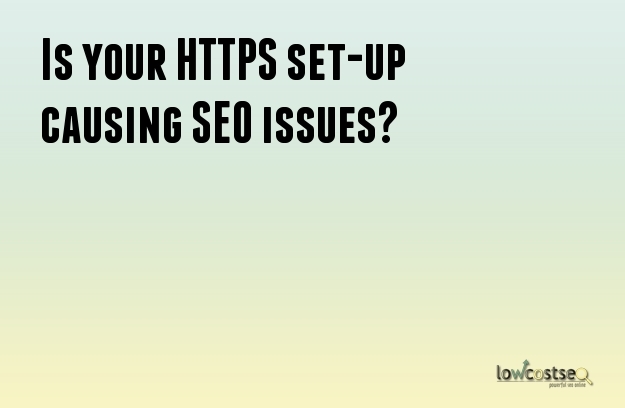 Is your HTTPS set-up causing SEO issues? While Google has already stated that those sites that are using HTTPS are going to be given only minor ranking boosts, there are a lot of websites that are still experiencing losses as a result of improper implementation. This is the reason why it is important to recognize what these common issues are to make sure that one gets to find the right ways on how to get them fixed. Google has since been making the necessary push so sites would actually more to HTTPS. Many people have actually heeded the call and have started to have this included in the SEO strategies and campaigns that t are making. It has been revealed that about 34% of the search results in Google are actually HTTPS. This is certainly more than what most have expected. But this is certainly considered to be a really good sign as this means that more and more sites are actually becoming more secure. However, it has been a common occurrence since that as more sites are migrating towards HTTPS, the ore of them may not have been doing the migration the right way too. This is not good news as this would usually mean that they are likely going to end up losing out on the ranking boost for the HTTPS. There are even those that have experienced more problems n their site as a result of not migrating the proper way. One of the most common issues that people seem to have been experiencing when migrating is the fact that they have not set up their site version for the HTTPS so the preferred one, this means that they still have their HTTP version around. While Google said that by default, they will index the HTTPS, there may be problems that will come up as a result. With two versions of the site that are live, there is the problem with duplicate content, dilution of the link, as well as a waste of the budget for the search engine crawl. Duplicate content is a valid issue since if Google will see two versions of the site that are live, then it might tag it as duplicate content since the canonical tags were not properly leveraged. This would mean that the HTTP and the HTTPS versions are likely going to be indexed. There are also those sites that do have their canonical tags all in place, but the problem is the setup is not done correctly. There is the problem of link dilution hen there is two version of the site that are live. This means that users are likely to come across the two versions of both the sites and there is a very good chance that they will be linking and sharing them respectively. As a result, the social signals, as well as the equity of the external link, is going to be divided between the two different URLs instead of just being focused on a single one. Proper migration to HTTPS is very important too as this will end up with both the engines crawling. That is going to be such a waste of the crawling budget that you have set. The search engines now have to double the work and this can become such a problem especially for large sites.